It's hardly news that DC Comics officials could be gigantic assholes to Jerry Siegel and Joe Shuster, or, to use the kindest reading of newly available documents possible, that the relationship between writer Siegel and DC Comics was overheated and saturated with rigorous, curdled dysfunction. It's just that now, thanks to the Siegel Family and public disclosure laws, there's better, sadder evidence than ever before that a kind of surpassing nastiness and rage and arrogant dismissal lies at the heart of comic books, the place where children and too many grown-ups with the moral outlook of children still trick themselves into believing that's where you find Truth, Justice and the American Way. Comics is an industry built on exploitation. No amount of giving each other awards, or doing work of a noble sort off the books and behind the scenes, or reforming a system so that it becomes in some cases slightly less horrible -- none of it changes that basic fact. The level of discourse between DC Comics and Jerry Siegel should surprise only in that nearly every single creative professional sees in its talk of necessary abortions and unfit artists an exchange they've endured, a relationship they've suffered, a dismissal of idea or an ambition they've experienced. We are the only industry that so loves its Colonel Parkers and so distrusts its Elvis Presleys. That managers and makers have spent equal time this summer preening in the spotlight of appreciation brought by a world starved for idiosyncratic creation shows just how damaged we've become. Comics' original sin echoes over the course of its history. It rips to the surface in a variety of nasty ways to which old men, widows and children mournfully testify. It spawns a thousand and one grinning doppelgangers carrying a bag of the oldest tricks. It rains abuse on a creative class that at times bristles, at times is grimly accepting, and at times gives birth to one or two poor, depraved souls that will fight for the imagined rightness of someone else, many someone elses, to benefit from an inspired act of creation ahead of that creator. 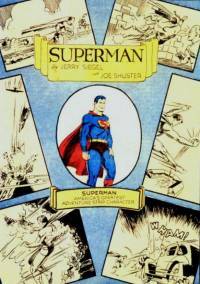 What happened to Jerry Siegel and Joe Shuster isn't history, not in the way history is usually defined. It is close, and it is awful, and it can't help but make you just a little bit sad. One could say we deserve it, only nobody deserves it.